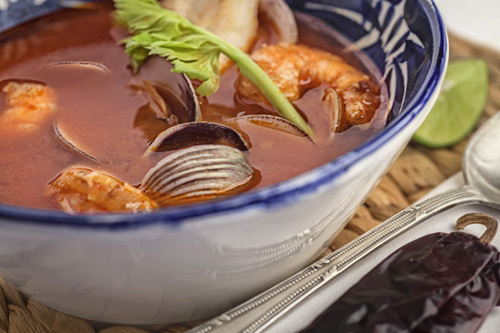 With just one tiny taste of this delicious soup you will have all the flavor and richness of the Mexican sea in your palate. The shellfish soup consists of a tasty tomato broth with chili , of harmonious taste, to which carrots and celery is added to give freshness. Then as it can be expected the broth is covered with shellfishes, in this recipe shrimps and clams are used – that give a very interesting flavor. As final touch the soup also has fish chunks that help to diversify the flavor. An authentic delicacy! This soup can be served as first dish or you could also start with a salad or an appetizer. And then serve the soup as main course since it is very abundant and very nutritious. It is a bit complicated to make this soup because it is done in many stages and there are many steps to follow. However everything is explained in detail so you won’t have any problem. To make the soup fish fillets are needed, we recommend buying white fish. Some good options are the red snapper, sea bass, sole, mahi-mahi, etc. In this soup it is indispensable to use fish stock, which you can prepare with us and it will have a better flavor than the bought ones. The chipotle pepper that is used in this recipe can be bought canned or you can also prepare it with us. The total preparation time is of 45 minutes . This recipe serves 6 plates. Rinse 10.5 oz of clams, then reserve. The enough Water to cover all the clams that were rinsed. Mix very well the bowl ingredients, with a mixing spatula, until the salt dilutes. Incorporate in the bowl the clams that were rinsed and leave them soaking for 30 minutes, so the sand is removed. Cut 1 celery stalk into small chunks, then reserve. Peel 2 carrots and slice them. Then set aside. Finely chop 1/4 of an onion (1.2 oz) and reserve. Clean 14.1 oz of fish fillets and cut them into large chunks; then reserve. Peel 17.6 oz of shrimps. Remove the head of the shrimps that were peeled and the vein that is locate in the upper back. Then set aside. Remove the veins and the seeds of 4 guajillo peppers. The 4 Guajillo Peppers with the ones you worked. Bring the saucepan water to a boil over high heat and leave the chilies cooking in the boiling water for about 5 minutes, until they soften. Take from the bowl the clams, with the kitchen spoon and rinse them; then set aside. The small chunks of Celery that were cut. Mix the saucepan ingredients and fry them for about 4 minutes, until the celery and the carrots are lightly fried; stir regularly. Strain the Salsa that was blended. 2 qts of Fish Stock. The Clams that were cleaned. The large chunks of Fish Fillets that were cut. The Shrimps that were peeled. If necessary the enough Water to cover all the ingredients. Mix the saucepan ingredients and bring the shellfish soup to a boil over high heat. When the shellfish soup boils reduce to low heat and cook it for about 5 minutes, until the shrimps are well cooked; stir occasionally. Don’t cook the shellfishes for a long time because its consistency won’t be good. Tip: This soup can be accompanied with crackers or with some tostadas. Suggestion: You can put some lime to this soup – it gives a very good taste. Variation: Since you like the soups and you like the shellfishes you also have to try the crab chilpachole. An amazing Veracruzan dish! Did you like the Seafood Soup? If you need guajillo peppers buy the Don Enrique they are the best. Season the soup with the unbeatable flavor of the organic thyme. To cook the seafood soup you will need a large saucepan like the Excelsteel. The advantage of this saucepan is that it is very resistant because it is made of stainless steel and since its base is encapsulated it distributes better the heat.